by Steven Case and Amy Kemp, 2017. The General Assembly of 2005 adopted Clogging as the official folk dance, and Shagging as the official popular dance. The appointment of state dance has been in contention in the North Carolina legislature since 1987, when Rep. David Redwine of Brunswick county submitted a bill to name Shagging the state dance, even going so far as to demonstrate the three-step to his legislative subcommittee. The movement failed, largely due to opposition from other dance factions. 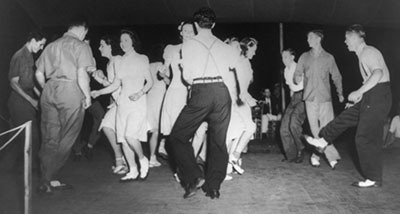 Three-dance bills (Shagging as state beach dance, Clogging as state folk dance, and Square Dance as American folk dance) were introduced in 1993, 1995, and 1997 but at the time it was reported that the lawmakers wanted to spend their time on ‘weightier matters.’ A separate bill was also introduced in 1997 to make Square dancing the official state dance, and supporters hoped to have it passed in time for Charlotte to host the 47th annual National Square Dance Convention in 1998. Once again, the bill failed. The issue again appeared in 2005, when Senator Walter Dalton of Rutherfordton urged the North Carolina senate to reclaim its heritage by adopting the shag as the state dance in retaliation of South Carolina doing similarly in 1984. Dalton accused South Carolina of making millions of dollars by stealing North Carolina’s historical dance and openly declared ‘war’ on South Carolina’s legislature. The bill, which also included clogging as the state folk dance, was passed 47 to 1 in the Senate and 101 to 7 in the House of Representatives. Clogging (the name of which derives from the Gaelic word for "time") is the name of a distinctive dance style which originated in the Appalachian mountains. Settlers from Northern and Western Europe (such as Holland, Germany, and the British Isles) brought their respective folk dance traditions to the colonies, which were further shaped by Native American and African American dance influences. These influences all combined and evolved into a percussive "foot-tapping" style of dance now known as Clogging. In the 1920's, Bascom Lamar Lunsford added team clogging to the competitions held at his annual Mountain Dance and Folk Festival in Asheville, thus helping to establish Clogging as a significant part of Appalachian cultural heritage. Clogging is danced in time with music, with a heel move usually occurring on the downbeat in order to keep rhythm. Historically, clogging has also been called jigging, buck dancing, flat-footing, and back-stepping. Famous clog groups include the Soco Gap Dancers, who won the first Appalachian clog competition in the 1920’s and went on to perform for Eleanor Roosevelt and the Queen of England, and the modern clog group All That which placed second on the television program America’s Got Talent. AN ACT ADOPTING OFFICIAL STATE DANCES. "§ 145-24. Official State dances. (a) Clogging is adopted as the official folk dance of North Carolina. (b) Shagging is adopted as the official popular dance of North Carolina." In the General Assembly read three times and ratified this the 13th day of July, 2005. Binker, Mark. "Shagging, Clogging 1 Step from Passage - The Two Dances Face One Last Vote in the Senate Before they can Gain the State's Seal of ''Official. ''," Greensboro News & Record (NC), July 10, 2005: B1. Binker, Mark. "It's War!," News & Record: Blogs (Greensboro, NC), April 27, 2005. Rhee, Foon. "Official N.C. Dance Step: Is it Square? Shag? Clog?," Charlotte Observer, The (NC), March 28, 1997: 1C. Rice, David and David Ingram. "Clogging, Shagging Voted Official State Dances by Significant Margin," Winston-Salem Journal (NC), July 10, 2005: 2. "Political Notes; Legislators: May we have this Dance?," Star-News (Wilmington, NC), April 17, 1995: 1B.